Table Lamps made to last. Pick out your Table Lamps here today. 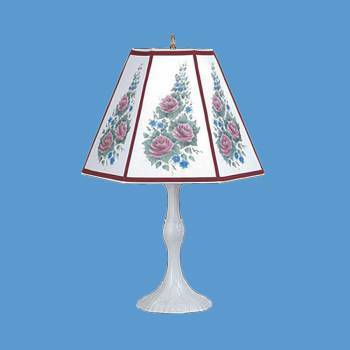 Rose Shade 12 in. H x 16 in. bottom dia. Features a white enamel metal base 6 3/4 in. dia. Table Lamps: Renovator's Supply's Cabbage Rose Table Lamp has a white enamel metal base & a parchment cut shade with satin trim. Measures 25 in. high & 16 in. width. Shade measures 12 inch high. Accepts a 3-way 100 watt bulb.